This quilt design is as fresh as a day in May! May Basket is a traditional patchwork basket, revised for Eleanor's quick sewing methods. 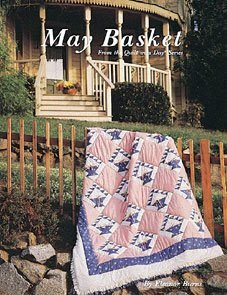 This charming quilt can be Amish in dark, solid colors, or Victorian in calicos with lace trim and a ruffle. The handle is easily made with quick marking, sewing, and pressing techniques. As an added bonus, instructions are included for pillows, shams and a wallhanging.